Brandon is a Data Science/ BI and Data visualization enthusiast from the NYC area. Data is hot right now. From the junior analyst to the Chief Data Scientist, individuals are finding new ways to get better understanding of the raw inputs provided by employees, customers, competitors, etc. 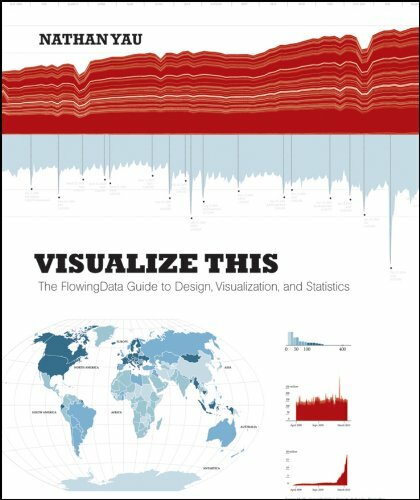 In his book,"Visualize This" , the goal of author Nathan Yau ("FlowingData" Blog; UCLA PhD) is to show how powerful data visualization can be in getting this understanding. He accomplishes this by having a laser focus on aspects of design and interpretation while using the new wave of technology that has formed and enhanced this exponentially-growing trend. Here are my major takeaways. Introductions to a wide variety of tools- The absolute best reason to pick up this book is to have a reference guide for any new projects you take on. Have a new geocoding project and not sure where to begin? Chapter 8 has a large section on visualizing regions. Almost every type of visualization has at minimum a few pages dedicated with an example provided in one of the tools. 20+ "R" scripts with step by step instruction - If you are in the process of learning 'R', this is a great way to dive in and start writing code immediately. I always find that walking through immersive example code is the best way to learn a new programming language. The reader can very easily 'fiddle' with the examples and learn the capabilities of each command. Data as Art - Nathans experience at the NYT is evident in every finished product. His approach teaches some very solid fundamentals that make it simple for both technical and non technical audiences to immediately understand the story. Errors within the examples - While most of the examples contained within the book work from end to end, I found half a dozen that contained missing steps or vague, abbreviated instructions that required personal research to resolve. As these issues are communicated to him, I hope he continues to update the errors section of his website and make the corrections within the next version. Technical barriers still too high - Putting myself into the shoes of a newbie datahead I feel that the jump directly into technical details would have been a huge stumbling block. Even worse for a non-programmer. If I was trying to communicate this message to focused on using Open Office Calc and Tableau Public as the building blocks instead of going directly for Python, R, and Illustrator. Use of Adobe - While I completely agree that Illustrator is the industry standard, I feel there is a conflict between his interest in free, open source software and his extensive use of one of the most expensive consumer applications. In his defense he does list open source "Inkscape" as an alternative but you will have to simultaneously learn this software as well as the concepts as all the demos are using Illustrator. Regardless of its flaws, I would still highly recommend this book to anyone who is interested in learning more about data storytelling. I feel that this book has helped me develop a wider base of visualization knowledge and helped fill in some technical gaps. PS - Make sure you check out the last page of the introduction. It provides a flowchart on how to read the book so you can take a 'choose-your-own-adventure' style path to get what you need from it.